Hippocrates, the Father of Medicine, 431 B.C. If we start asking you about your health, would you be able to give a clear definition? If we look around us, would we be able to find someone free from toxicity? If we know well our body and its mechanism, would we try to damage it? It is common knowledge that psychology can enhance the immune system of an individual and its effectiveness. Our philosophy is to uplift the Psycho-Healthology by empowering us to help ourselves. I will now ask you to take a decision in order to change your destiny. We humans live together amid a vast maze of distances separating us; distances made short and easy to trespass nowadays. Yet, nothing but the feeling of living in the secure hearts of our beloved, can carry us to the ecstasy of victory which is the essence of passion to life. It is a thin thread that separates youth from adulthood; it is the edge between summer and autumn; the brink of happiness and misery. This life is a combination of struggles, troubles, forms and norms. Thus your chances to stumble might increase, thus weakening your chances stand still against them. 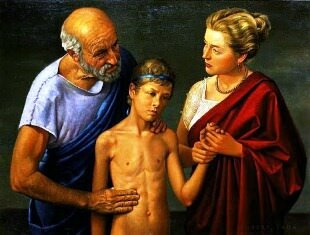 Hippocrates examining a child, by Robert Thom, 1950's. Many are the cases that medicine is unable to solve or find a cure to, and the reason is that we are in the third generation of pathological health systems, starting since the early seventies of last century and renewing every 20 years. The third generation is almost genetically damaged; so no wonder if the level of disease progressed and immunity disappeared thus, reflecting on the behavior of individuals and communities. A society which concentrates on quantities of food it eats, and not on its quality, is not reconciled with oneself; because it is diverting from Eve's Apple to the Two Apples hookah tobacco. This is the level of awareness prevailing now, unfortunately. Poor he who is driven by this feeling! If the saying "Eat all the delicacies you might encounter" was nice to the ear, then the saying "Food is not all what man needs" addresses man in all generations. The more clean and healthy our food was, the better our lives. If the big boom was the reason for your life now, another explosion, more furious, more disastrous may destroy all what you've built through generations. This does not represent any adoption to any school, or creeds neither does it represent an aberration or illusion; it is reality based on the situation of observation and, may at any time, annul the original. If man did not start this mission of conciliation with himself, he will definitely become extinct. I do really fear that health would be on the black list of endangered characteristics among people who, unlike cars who are born mature, grow up throughout years to be what he is. Nevertheless, instead of asking him "How do you do?" you'd rather ask him "What of you is still sound and healthy?"